The BlackBerry Media Player on the Curve , BlackBerry 8800 and the BlackBerry Pearl could not play digital music on iTunes. The .M4p files are not recognized on all BlackBerry devices. so the protected AAC files you previously purchased on iTunes won't work with BlackBerry Media Player. That's because the iTunes tracks that you purchase and download are in a "protected" AAC or M4P audio format and you can't play them outside of the iTunes environment. However, you can play the .m4p music files on your Blackberry device by converting the .m4p files to unprotected MP3 files with TuneClone. TuneClone is an audio converter software to help you convert the protected DRM (Digital Rights Management ) music files purchased from iTunes and other online music stores to unprotected mp3 files, so you can play your music files on any devices of yours. 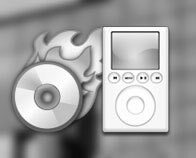 Normally, you can convert the protected music files to plain MP3 by burning your music library to CD-R disc to make an audio CD with iTunes, then you can use CD ripper software to extract the music files from the burned CD and save as unprotected mp3 files. This method is working. However, it will waste you lots of CD-R disc and time. The burning and ripping process is very slow. Furthermore, the ripped back mp3 files lost all the track information, such title , album and artist etc.